[vc_row][vc_column][vc_column_text]It all started somewhere. Can you remember? For some of us it was burned in as soon as our brains were connecting the neurons that fire our right wrist. For others, it was just after mom and dad gave up fighting it. What seems to be consistent is the rarity of meeting a motorcycle rider who does not recall their first bike. 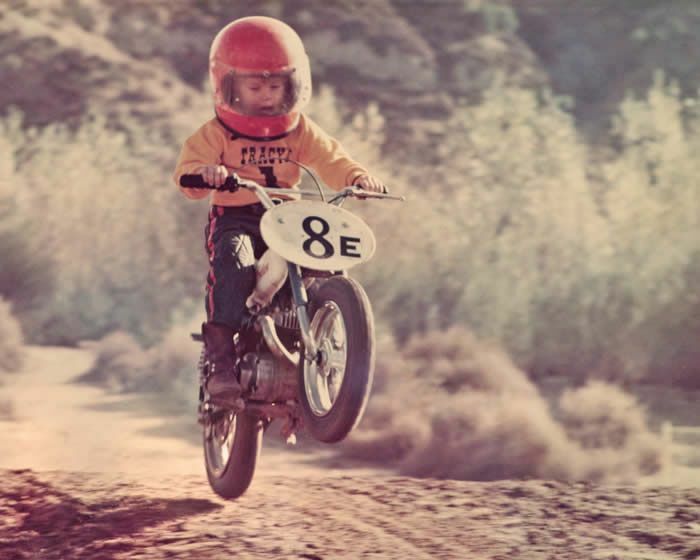 And so the cycle continues, like a family gem passed down through generations, those of us who were lucky enough to be “born into it” feel some primal obligation to pass along the joy of motorcycling. Remember handing wrenches to your old man late at night? Running to the fridge to retrieve cold cans of cheap beer and placing it on a work bench full of head gaskets and carburetor needles? Those are the small things that contribute to the fond memories. It’s not just the places you go, but the time spent pondering them. It’s not just the act of twisting the throttle but the pride in teaching your kid to do it. There’s a special feeling involved with sharing motorcycling with others and knowing that when they smile in the wind you had something to do with it. If your child or grandchild is ready to swing a leg over a bike there’s a good chance it’s going to be on a Yamaha PW50 or something very similar. Probably not much different mechanically to the bike you learned to ride on. When they do, the smell of that simple two-stroke is likely to bring back memories that were hidden behind the epic road trips, the far away races and the muddy adventures. Be prepared, because the smile it will bring to your face is as strong as any smile you’ve had from the seat of a bike. Watching them place their tiny feet on those foot pegs and dash off through the summer weeds will stir up emotions that remind you why motorcycles are so important to you. Snap out of it though, whiskey throttle must be tamed early and trees are as hard as they were when you first started running into them. Adventures come in all shapes and sizes. Here’s to the ones you’ve been on, dream on and inspire in others. I love what you are doing with Armchair Adventures. It shares so much of the joy of riding and not in the typical biker manner. We ride for so many reasons and each of us has a unique relationship to the experience. As a writer, I often find myself wrestling with the words to convey those special moments we all share. Love to get my grandsons (Reckless Rex and the Jack-Attack) started and almost forwarded to their parents but caught myself when I noticed no hand protection. Their Mom would freek-out. You could always reminder her that photo was from a different time Bob. A little more “relaxed” :). We some how made it through huh! You nailed it Brother. I just found out I am going to be a Grandfather and I can’t wait to teach him / her to ride! Thanks for the great post! Congrats Nick. Thanks for following us.